The debate between building a business intelligence system from the ground up or buying a pre-packaged solution has been going on for years. Many companies that plan to deploy a BI solution will consider the in-house option first because they perceive an in-house solution can be more easily adapted over time, require no dependency on an external provider, and be less costly and more scalable in scope. A well-designed pre-built solution, with some minor customization work to extend the data model, can be fully adapted to any specific business requirements pretty quickly and with minimal risk. Working with an established software vendor, which will have a commercial interest in maintaining support, is a less risky proposition than relying on external consultants or even internal resources. A best-of-breed BI solution will also have a proven track-record of deployment within fixed costs and timescales, and customer references to demonstrate its proven ability to scale. Ultimately, building an enterprise business intelligence system is complex. It requires industry experience to determine what data to look at and the technology skills to manipulate that data into meaningful form. Packaged BI solutions alleviate much of the technical drain on IT resources, particularly when it comes to creating the data model for the enterprise data warehouse from which all analysis and reporting is driven. Since there is no way of proving in advance that all the necessary data is included and that it all has the correctly defined relationships, firms building their own data warehouse must create their data model based on the best available assumptions, then work through many stages – all of which can be technically difficult, costly and time-consuming. A best-in-class business intelligence provider, on the other hand, can bring to the table an extensible pre-built data model that’s been proven time and time again. Plus, a pre-built solution can provide access to cutting-edge approaches that would normally be outside the scope of an in-house project – like the extraction, transformation and loading of data from external sources (e.g., retail point-of-sale). Simple, static data reports are generally easy to incorporate into an in-house developed BI system, but many users expect to perform robust analysis. Reports need to be interactive and enable users to easily drill-down and navigate through the data. Unfortunately, it’s very difficult to build visualization and analysis that truly supports drill-down capabilities for rich analysis and easy data digestion. Plus, empowering end users to perform ad-hoc reports on their own—specific to their individual business requirements and not just to consume content—is great but difficult to scope into a new build. Packaged solutions are designed to provide granular levels of analysis and help companies answer the most critical questions related to business performance across all functional areas of the organization. They enable robust analysis via highly advanced, built-in calculations and other algorithms that would otherwise require significant technical knowledge to create. And, they can be easily configured to deliver business intelligence information to users in a variety of ways without IT intervention – from basic on-line analysis and reports to performance scorecards, dashboards and e-mailed alerts. 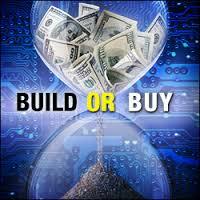 Perhaps most important about the build vs. buy debate is total cost of ownership (TCO). Software license and maintenance fees aside, the TCO for building a BI platform can be exorbitant when you consider the costs incurred for headcount to create and maintain a custom build. This means people in software development, application maintenance, support, training, QA and management who will be required to develop and maintain the in-house business intelligence system (regardless of whether you use internal resources or outside consultants). Why are these costs typically high? Oftentimes, companies don’t necessarily know what their end-user requirements are, what data sources they’re going to have to deal with, or what rules and calculations are going to be required for their reports and analytic views. All of these “unanswered requirements” can result in a lot of time and effort being wasted. Since packaged BI solutions already address these requirements (or can accommodate them fairly quickly), they offer a much lower TCO overall. What inspired me to write this post is that so many of Silvon’s customers started down the path of creating their own business intelligence and reporting systems and spent hundreds of thousands of dollars and precious resources before they had to abandon their projects and reach out for help. A BI “build” is not a project for the light-hearted (or resource-constrained). Do be sure to consider all of your options first! Should You Acquire BI Technology From Your ERP Vendor?